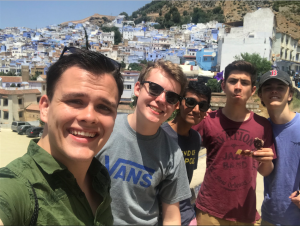 Aidan is from Drexel Hill, PA and participated in the Morocco Summer 2018 program. Traveling to another country for an extended period of time is hard in any situation, but traveling to Morocco with no prior experience in Arabic really proved to be a challenge at first! 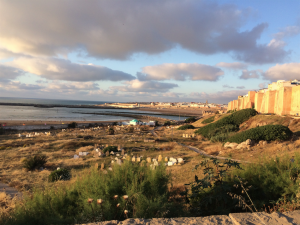 When I arrived in Morocco, my NSLI-Y roommate Talat and I were greeted by our host mom, aunt, and sister, and were taken through the winding streets of Rabat, and through the مدينة قديمة, or old city, to our host family’s home. We were immediately taken aback by both the beauty of the crowded سوق, or market, and some of the differences between Moroccan culture and the American customs we were used to. For example, we did not expect to have the entire extended family, about 15 people in all, to be living in the same house! However, our host family was immediately welcoming and accepting, and always tried to help us with our language learning and to make us feel at home in Morocco. With 15 people in the same household, it was often hard to connect with everyone in my host family. However, despite our many differences, it was through the World Cup that I really felt I could connect with members of my host family. After we arrived, Talat and I were soon introduced to our host brother, Houssam. Houssam was about our age, and when we met, I immediately asked him if he liked soccer, or كرة القدم. Having just arrived, Talat and I knew very little beyond basic greetings in Darija, the Moroccan dialect of Arabic, but I knew how to describe the World Cup. I was pleasantly surprised that Houssam and I both enjoyed watching the World Cup, although he was disappointed that Morocco had lost to Portugal the night before. 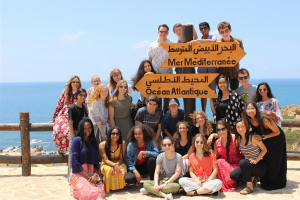 As my Arabic skills progressed throughout the NSLI-Y program, I found I was able to use my new vocabulary to better converse with Houssam and my host family. Knowing how to discuss different countries’ teams and players helped me to really bond with him and others. Although Morocco was eventually eliminated from the World Cup, I was able to buy a jersey to support my host country’s team! Even my usually quiet host grandfather was eager to point out the names of the countries who were playing on TV. Up until the final, when Houssam was rooting for Croatia, and I for France, it was a great time. I found that soccer allowed me to find new friends in Morocco, from the local kids and host brothers playing in the narrow alleys of our neighborhood, to the elderly man who jumped in our pickup game one time! My interactions with my host family weren’t just limited to the World Cup; as my language skills improved I found I was able to discuss more and more, from tonight’s dinner, to asking for help with the laundry. Talat and I even cooked some (unfortunately albeit burned) pancakes for them to show them some American cuisine. Houssam ended up being one of our best Moroccan friends from our NSLI-Y experience; he even showed us Hamza Food, a local restaurant serving falafel and chawarma, that ended up being really popular with everyone in my NSLI-Y group! However, the World Cup provided me and my host family with the initial common ground in which we could discuss something that we both cared about, and it showed me that in a country of many differences, in many ways we still were very much the same.